• For quantitative determination of alkaline phosphatase (ALP) activity using stable p-nitrophenol phosphate substrate. • High sensitivity and wide linear range. Use 5 μL serum or plasma sample. The detection limit is 2 U/L, linear up to 800 U/L. • Homogeneous and simple procedure. Simple "mix-and-measure" procedure allows reliable quantitation of ALP activity within 5 minutes. • Alkaline phosphatase (ALP) catalyzes the hydrolysis of phosphate esters in an alkaline environment, resulting in the formation of an organic radical and inorganic phosphate. In mammals, this enzyme is found mainly in the liver and bones. Marked increase in serum ALP levels, a disease known as hyperalkalinephosphatasemia, has been associated with malignant biliary obstruction, primary biliary cirrhosis, primary sclerosing cholangitis, hepatic lymphoma and sarcoidosis. Simple, direct and automation-ready procedures for measuring ALP activity in serum are becoming popular in Research and Drug Discovery. 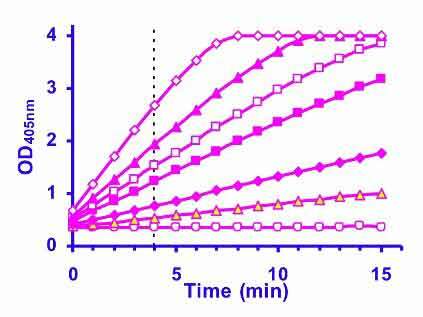 BioAssay Systems QuantiChrom™ Alkaline Phosphatase Assay Kit is designed to measure ALP activity directly in biological samples without pretreatment. The improved method utilizes p-nitrophenyl phosphate that is hydrolyzed by ALP into a yellow colored product (maximal absorbance at 405nm). The rate of the reaction is directly proportional to the enzyme activity. 1. Can the calibrator and water blank be measured after the samples, and if so how long after? We recommend measuring calibrator and water blank simultaneously with the samples, to avoid any potential sources of error, but it is not essential. Potential sources of error that can be introduced by non-simultaneous measurement are: variations in pipetting volumes, variation in microplate reader performance, evaporation of reagents caused by long incubation, etc. 2. There are yellow chrystals in the pNPP vial - can I still use the product? Yes, but you first have to dissolve the crystals. The yellow crystals are phenol which has separated from the reagent during the freezing process. Heat the vial until all phenol crystals disappear (melting point is around 40 °C), and mix well before use. 3. Is pNPP light sensitive? Does it need to be handled in the dark room only, and dark colored 96well plates necessary? pNPP is light sensitive and must be stored protected from light, but it can be used under normal laboratory conditions. Only clear flat bottom microplates should be used. Do not use plates, where the bottom is not clear and flat. 4. How do I measure ALP activity animal tissue? Homogenize tissue sample in 10 mM Tris Buffer (pH 8.5), 50 mM NaCl, or lysis buffer of your choice. - The assay is compatible with up to 2% SDS or Tween-20 in the sample. - The assay is incompatible with EDTA, oxalate, fluoride, citrate. - Centrifuge homogenized tissue sample at 10,000 x g for 10 min at 4°C. - Use the clear supernatant for alkaline phosphatase assay. 1. Wan, Y et al (2007). PPAR-g regulates osteoclastogenesis in mice. Nature Med. 13(12): 1496-1503. Assay: ALP in Mouse Serum (Pubmed). 2. Sekiya, S, Suzuki, A (2011). Direct conversion of mouse fibroblasts to hepatocyte-like cells by defined factors. Nature 475(7356):390-3. Assay: ALP in Mouse Plasma (Pubmed). 3. Kim, HJ et al (2006). Glucocorticoids suppress bone formation via the osteoclast. J Clin Invest. 116(8):2152-60. Assay: ALP in Mouse Serum (Pubmed). 4. Panizo, S et al (2009). RANKL increases vascular smooth muscle cell calcification through a RANK-BMP4-dependent pathway. Circ Res. 104(9):1041-8. Assay: ALP in Rat Vascular smooth muscle cells, lysate (Pubmed). 5. Wang, Y et al (2011). Small interfering RNA knocks down the molecular target of alendronate, farnesyl pyrophosphate synthase, in osteoclast and osteoblast cultures. Mol Pharm. 8(4):1016-24. Assay: ALP in Mouse primary osteoblast cells (Pubmed). 6. Bhattacharya, A et al (2006). Effect of fish oil on bone mineral density in aging C57BL/6 female mice. J. Nutr. Biochem 18(6):372-379. Assay: ALP in Mouse serum (Pubmed). 7. Lian, Q et al (2006). Establishing clonal cell lines with endothelial-like potential from CD9(hi), SSEA-1(-) cells in embryonic stem cell-derived embryoid bodies. PLoS One 1:e6. Assay: ALP in Mouse Stem cell line (Pubmed). 8. Henderson, JA et al (2008). Concurrent differentiation of marrow stromal cells to osteogenic and vasculogenic lineages. Macromol Biosci. 8(6):499-507. Assay: ALP in Rat bone marrow stromal cells (Pubmed). 9. Keskar, V et al (2009). In vitro evaluation of macroporous hydrogels to facilitate stem cell infiltration, growth, and mineralization. Tissue Eng Part A. 15(7):1695-707. Assay: ALP in Human Mesenchymal stem cells grown on hydrogels (Pubmed). 10. Oldinski, RA et al (2010). Synthesis and characterization of a Hyaluronan-polyethylene copolymer for biomedical applications. J Biomed Mater Res B Appl Biomater. 94(2):441-6. Assay: ALP in Human Cells (Pubmed). 11. Gaharwar, AK et al (2011). Assessment of using laponite cross-linked poly(ethylene oxide) for controlled cell adhesion and mineralization. Acta Biomater. 7(2):568-77. Assay: ALP in Mouse Preosteoblast cells grown on nanocomposites film (Pubmed). 12. Kauther, MD et al (2010). Alpha-calcitonin gene-related peptide can reverse the catabolic influence of UHMWPE particles on RANKL expression in primary human osteoblasts. Int J Biol Sci.6(6):525-36. Assay: ALP in Human Primary osteoblasts, lysate (Pubmed). 13. Hutchins, HL et al (2011). Eicosapentaenoic acid decreases expression of anandamide synthesis enzyme and cannabinoid receptor 2 in osteoblast-like cells. J Nutr Biochem. 22(2):195-200. Assay: ALP in Mouse osteoblast cells (Pubmed). 14. Pali?, D et al (2011). Use of rapid cytochemical staining to characterize fish blood granulocytes in species of special concern and determine potential for function testing. Fish Shellfish Immunol. 30(2):646-52. Assay: ALP in Fish Granulocytes (Pubmed). 15. Katuru, R et al (2011). Mevalonate depletion mediates the suppressive impact of geranylgeraniol on murine B16 melanoma cells. Exp Biol Med (Maywood) 236(5):604-13. Assay: ALP in Mouse B16 cell lysate (Pubmed). 16. Stewart, AA et al (2008). Effect of dexamethasone supplementation on chondrogenesis of equine mesenchymal stem cells. Am J Vet Res. 69(8):1013-21. Assay: ALP in Horse Mesenchymal stem cells (Pubmed). 17. Milne, TJ et al (2009). Induction of osteopenia during experimental tooth movement in the rat: alveolar bone remodelling and the mechanostat theory. Eur J Orthod. 31(3):221-31. Assay: ALP in Rat serum (Pubmed). 18. Ponnapakkam, T et al (2010). A treatment trial of vitamin D supplementation in breast-fed infants: universal supplementation is not necessary for rickets prevention in Southern Louisiana. Clin Pediatr (Phila). 49(11):1053-60. Assay: ALP in Human blood (Pubmed). 19. Ku?ukali?-Selimovi?, E et al (2011). Evaluation of bone remodelling parameters after one year treatment with alendronate in postmenopausal women with osteoporosis. Bosn J Basic Med Sci. 11(1):41-5. Assay: ALP in Human serum (Pubmed). 20. Zhi, L et al (2011). Synergistic effect of recombinant human bone morphogenic protein-7 and osteogenic differentiation medium on human bone-marrow-derived mesenchymal stem cells in vitro. Int Orthop. 2011 Apr 13. Assay: ALP in Stem cells culture (Pubmed). 21. Fasina, YO, Thanissery, RR (2011). Comparative efficacy of a yeast product and bacitracin methylene disalicylate in enhancing early growth and intestinal maturation in broiler chicks from breeder hens of different ages. Poult Sci. 90(5):1067-73. Assay: ALP in Chicken Small intestine tissue (Pubmed). 22. Ahmed I.M. Abu Obid Alla. Ph.D. Thesis. Effects of Strontium on Human Osteoblasts Extracted from a Cleidocranial Dysplasia Patient – In Vitro Study. Unviersity of Regensburg 2010. Assay: ALP in Human Cells (Pubmed). 23. Maskiewicz, R (2009). SUBLIMABLE SUSTAINED RELEASE DELIVERY SYSTEM AND METHOD OF MAKING SAME. US Patent application number: 20090220602. Assay: ALP in Enzyme Alkaline phosphatase (Pubmed).